SOQL is a query language to search your organization's data for relative information. 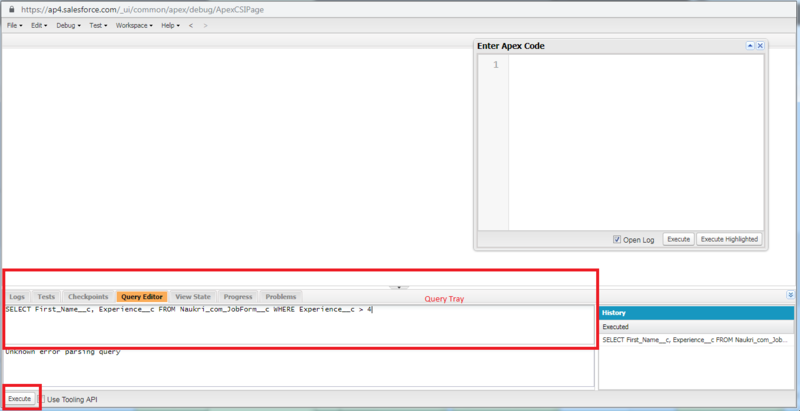 It is similar to SQL, it uses Object query language but not Joins for immediate navigation of data. It is similar to SELECT statement used for query language (SQL). It is used to retrieve data, data of a single sObject & its related sObjects. How to fetch data from the DataBase? Where to Test These SOQL queries? Database is a collection of tables which stores data in it. To fetch or retrieve data from DataBase, it is simple by using SOQL & SOSL querying in Salesforce. SOQL - Salesforce Object Query Language. SOSL - Salesforce Object Search Language. The above two languages helps us to deal with DB, to fetch required data. Apex Code = logic + Data Fetching Capability. This helps developers to deal with DB. This language works on the queries provided by it. Query is nothing but the set of keywords that we need to use properly with the help of few object names as well as conditional statements - it will bring required output. This evaluates to single SObject. This also evaluates to count of those objects (using “count” method). Enroll For Instructor Led Live SalesForce Training at Mindmajix. A SOQL query starts with SELECT clause and followed by 1 or more optional clauses which includes WHERE, GROUP BY, TYPE OF and ORDER BY. In the below mentioned format an SOQL query is queried. SELECT : Every SOQL query must start with this keyword. This keyword tells us which “fields” from the xyz Object we are interested. FROM : This keyword help us to mention in which “object” we are interested. WHERE : This keyword helps us to mention the “condition” of fetching records. I.e, only those records we can fetch which matches our business requirement, means condition. Steps: Login to Salesforce → Developer Console → Pess the bottom arrow of the window and select “Query Editor” Tab and place the code and “Execute”. Note: You cannot add any fields like First Name / Last Name in the above query, Salesforce will throw error, as other fields are not supported in aggregate. In the next topic, we will discuss in-detail about “SOSL Of Salesforce”. Keep following us for more info on Salesforce Development / Programming.